Fellow stopmoe John Sumner issued a challenge in March: identify two obscure books, win a prize. Long-post-short… I won! "Cogs, this one's gonna be short and sweet. First off, Don Carlson replied to the Crazy Daisy Ed post and mentioned an older book that might have some cool stop-mo references in it. However, the title and author are unknown. So load up in the Mystery Machine and take a look at his comment on the post about clues to this "gem" of a book. Second on the Unsolved list is a fabulous xeroxed section of a book on the history of puppet animation. The title is Puppet Animation in the Cinema. Being extremely lazy or, too busy, I haven't searched out the author and actual book. That's where you come in. The first cog to correctly find both books and show proof will win a prize... to be determined at a later time. I'm thinking along the lines of an illustration with subject matter of your choosing. But then you'd have to be brave enough to give my your address so I could send it to you. The challenge has been put forth." The book for John is Puppet animation in the cinema: history and technique by L. Bruce Holman (1975). I wasn't sure about Don's book, but suggested Who's Who in Animated Cartoons by Jeff Lenburg (2006) -- which Don says is correct. So, John emailed to ask what kind of original artwork I might like… I knew just what I wanted. 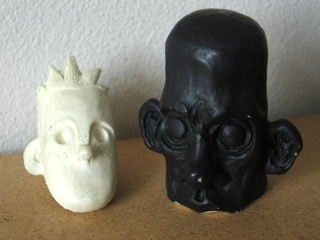 Machine In Use Studios (which John founded) often uses standardized resin heads, which then get Dremeled into final shape for particular puppets. I was hoping that there might be a spare blank lying around somewhere. "A little backstory -- I sculpted the head using chavant sculpture clay (oil base) and then made a two part mold out of RTV silicone. There's a company down here called Silpak where I got my materials, including the 'A'+'B' parts for the eurathane that I poured into the mold. There's still 'some' imperfections, but most of the major stuff I sanded off with a dremel inside a sanding box. The sanding box was great because it contained 99% of the dust + debris. The overall concept for these heads was to be a series for an illustration show (that never happened). I was going to continue modifying each head + paint them. I got a few made, but since the show was cancelled, I lost interest. Funny enough, I found the '7' head, same as your Cog ID#. Destiny?" Needless to say, I'm thrilled. I absolutely love getting to handle another artist's work, getting a sense of the materiality and craftsmanship.